This page provides information about Council-funded grants available for young people in the shire to run their own activities and projects. Photo: QRYG recipient Daikto in front of her 'Welcome to my Home mural' in Castlemaine. The mural was designed and painted to share with the community that Jaara Jaara people are the traditional owners of this land and to welcome visitors to our town. Mount Alexander Shire offers young people grants of up to $1,000 for projects that improve skills, opportunities and outcomes for young people. Grants are assessed and approved by Council's Youth Advisory Group. Am I eligible for a QRYG? How do I apply for a QRYG? Young people can apply for a Quick Response Youth Grant at any time of the year. Download the QRYG guidelines and application form below. 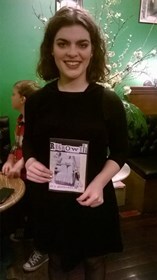 Bethany Robertson applied for a $1000 QRYG to support the publishing of a small magazine – Regrowth Zine, to share her personal struggle and recovery from chronic illness and mental illness. This was a very positive and successful project for Bethany and the other young people involved in the production of the magazine. Bethany's story was featured in an article in the Bendigo Advertiser in September 2016 titled "Fighting back from fatigue" which details Bethany's journey and recovery.